The SRS Reversing Switch enables the HV-230AE and HV-300AE Stylvent fans to operate in both supply and exhaust modes. 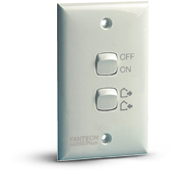 The SRS Reversing Switch is recess mounted, has an enclosure rating of IP30 and has a 70W × 114H switch plate. A recess depth of 25mm is required for mounting.